FIGURE 1. The Milkweed Assassin Bug provides excellent insect control and has distinctive red and black coloration. 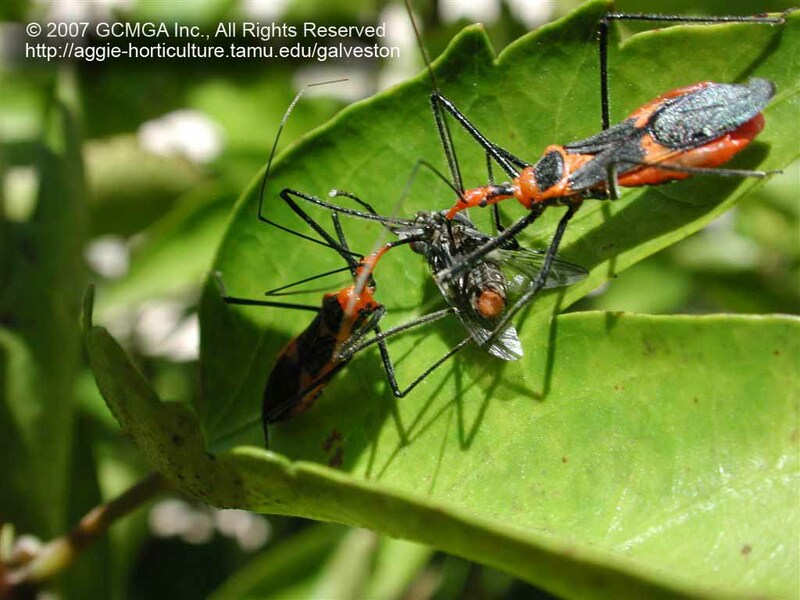 During on mild days, Milkweed Assassin Bugs continue to be active through the winter season in Galveston-Houston region. FIGURE 2. Milkweed Assassin Bugs have very long antennae and legs. Note the defensive posture towards the camera and photographer! FIGURE 3. Immature stages of the Milkweed Assassin Bug do not have fully-developed wings (immature wings are know as wing pads). Immature stages are known as nymphs and are voracious predators. FIGURE 4. Two similar-sized adult milkweed assassin bugs "share" a fly for mealtime. Wide variety of prey including flies, caterpillars, beetles, mosquitoes, etc. Several species of assassin bugs have widely known common names (ex., the Masked Hunter Assassin Bug, the Spined Assassin Bug) but the only common name found for Zelus longipes is Milkweed Assassin Bug. 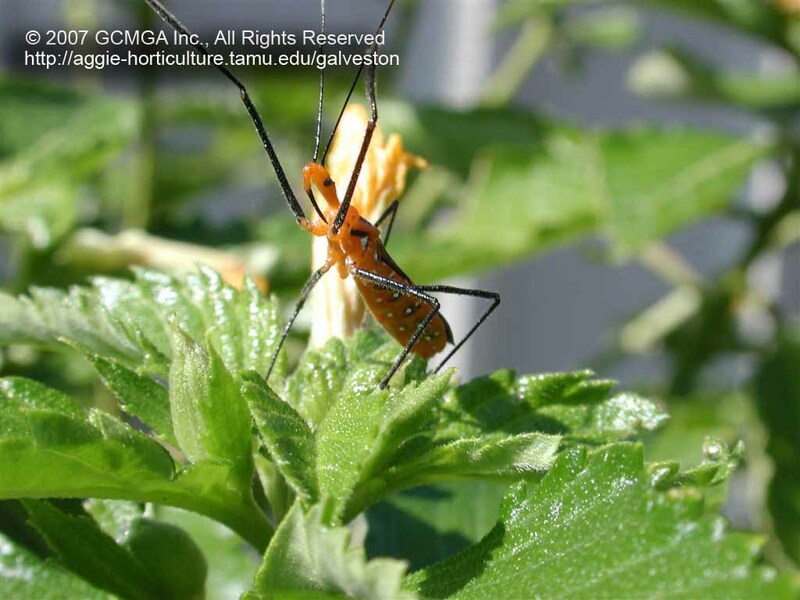 Nevertheless, the most commonly occurring species assassin bugs in Galveston County are Zebus longipes. The Milkweed Assassin Bug is attractively colored in bright red and jet black. We regularly see them patrolling the plants throughout the year in our Master Gardener Demonstration Garden adjacent to the County Extension Office. They are surprisingly active on winter days when temperatures are mild even when preceded by short periods of very cool (mid- to low-thirties) days! Determining the scientific name of this insect predator required some effort. We solicited the assistance of Dr. William M. Johnson (our County Extension Agent-Horticulture & County MG Program Coordinator) who in turn enlisted the assistance of three Extension Entomologists for identification of this insect. 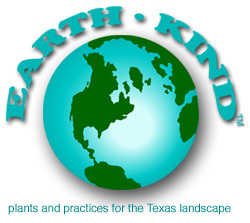 Milkweed Assassin Bugs are widespread in the Galveston County area and they are highly beneficial insects. They eat a variety of insects including aphids, armyworms, stink bugs, houseflies, etc. Milkweed Assassin Bugs have a bright red-colored body with long black legs, black wings and long black antenna. Local gardeners are becoming better aware of this beneficial insect based upon the increasing numbers of specimens submitted to the County Extension Office for identification over the last few years. 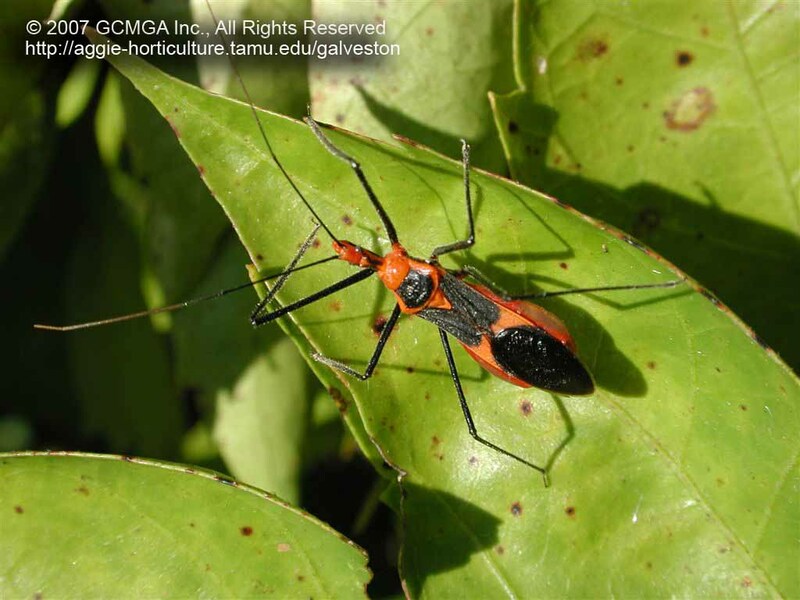 The Milkweed Assassin Bug is a very effective and abundant insect predator�they are worth conserving in our gardens and landscape! 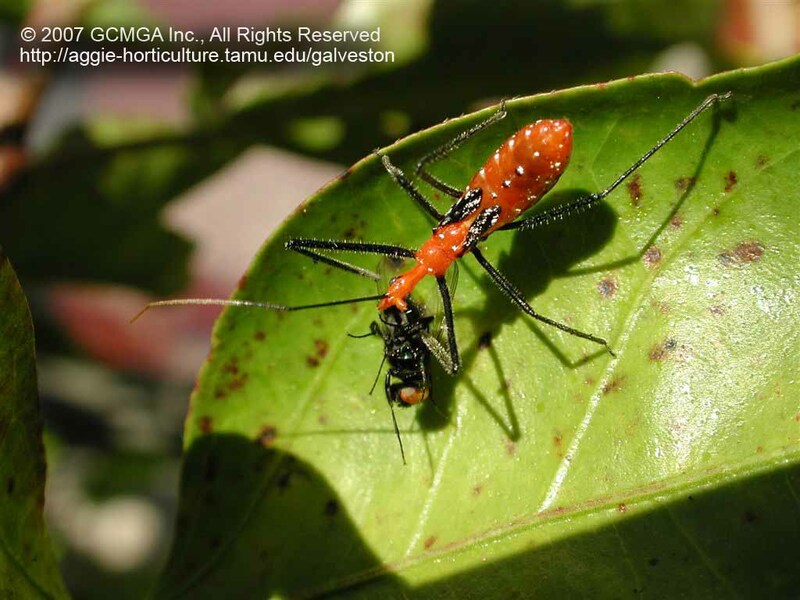 Assassin bugs are widely distributed throughout the Galveston-Houston region. Assassin bugs are usually dark-colored, with combinations of gray, green and black and are members of a large family of bugs (known as Reduviidae). Assassin bugs are excellent predators and are general feeders; i.e., they prey on a diverse variety of insect pests in the garden and landscape including flies, mosquitoes, beetles and large caterpillars. The aptly named assassin bugs often wait in hiding and ambush their prey. Typically, the eyes are large and set at the middle or rear of the head with a neck-like area behind the head. The antennae have four segments. Assassin bugs, like all true bugs, have piercing, sucking mouthparts (collectively called a beak) that are used to remove body fluids from the prey. The beak has three segments and rests within a groove between the front legs when it is not in use. Once prey is captured and punctured, salivary secretions are pumped through a canal inside the piercing/sucking mouthpart. The salivary secretions not only serve to quickly immobilize prey but they also dissolve the prey�s internal tissues. This process enables the assassin bug to withdraw the bodily contents of its prey. Like all members of the order Hemiptera, assassin bugs and ambush bugs go through a simple metamorphosis with egg, nymph and adult stages. In warm months, females lay eggs which are stuck in clusters to leaves and stems. After hatching, the wingless nymphs grow and molt 4 times (some species molt up to 7 times) before becoming full-sized, winged adults. Adults are usually the overwintering stage. In general, assassin bugs hunt on various types of vegetation, including trees, weeds and bushes. Assassin bugs are able to fly but they are poor fliers in general with some notable exceptions. Although most assassin bugs are slow-moving and non-aggressive, they will use their rostrum in self-defense if handled carelessly. Such bites may be rather painful to humans because the bugs inject the same salivary secretion used to dissolve the tissues of their prey. This results in the death of a small area of cells at the site of the bite. The symptoms are an intense burning sensation, often followed by a small, itchy lump that may persist for several days. However, no true toxin is involved so it is rare for the reaction to last long or to extend beyond the site of the bite. Some bites occur when the bugs are purposely handled out of curiosity, but most happen through accidental contact while gardening or working in the open. The sharp pain associated with assassin bug bites is usually enhanced by the surprise accompanying the experience.